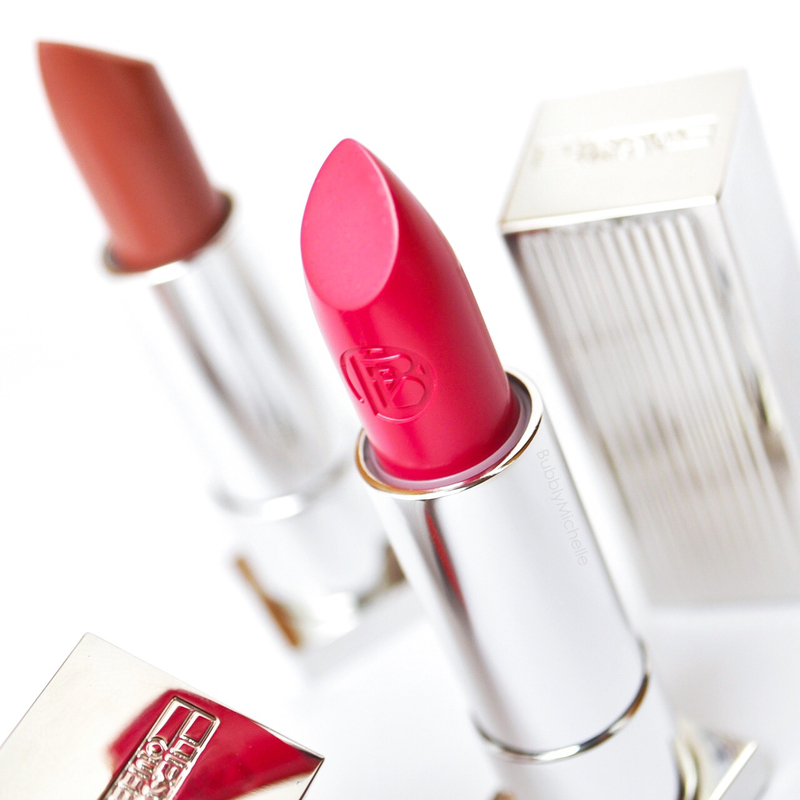 While in London I had the good fortune of discovering the newly launched Lipstick Queen Silver Screen lipsticks. The glossy counterpart of the ultra luxe Velvet Rope lipsticks that were released previously. The packaging alone is a complete 180 compared to the initial lipstick packaging that the Sinner and Saint ranges sport which is a rubbery plastic type. These Silver Screens are housed in a weighty silver casing with a magnetised cap, similar to the Velvet Rope lipstick except those are gold. Personally I prefer the silver and I believe this is by far one of the most elegant lipstick designs that have hit the market, yes, even better than the Tom Ford in my opinion. Which is a good thing as it justifies the whopping £35 price tag they carry. Moving on to application & formula. These lipsticks are creamy, but not to the point where you’d have to worry about it sliding around. In fact they seem to hug the lips and stay put. I also noticed that this glossier formula is more forgiving and applied smoothly without catching on to dry flakes and the refreshing minty flavour (naturally scented by Peppermint oil) leaves lips tingly as it glides on. Pigmentation wise, they’re almost opaque in two swipes with a tiny bit of transparency still peeking through, specially so in the lighter shades. 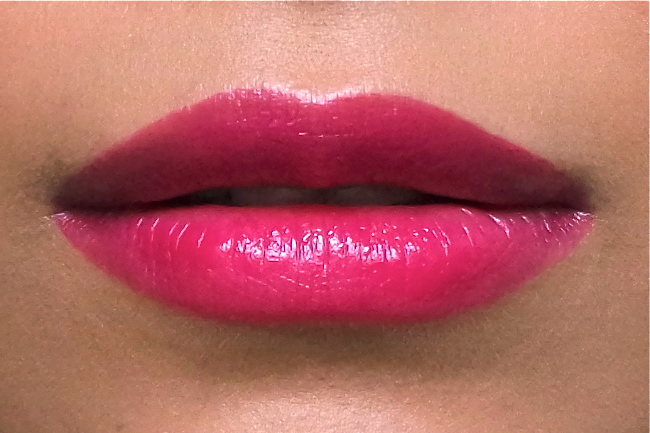 According to the online description the ‘mouth watering’ texture of these are said to be achieved with the high percentage of natural Pomegranate Sterols in these lipsticks. Also fortified with Vitamin A and E overall I found these to be one of the most comfortable lipsticks i’ve owned and were surprisingly weightless and hydrating given how pigmented they are. These wore well into 3 hours, though they transfered quite easily while sipping water and snacking. Although it must be noted they wore much longer than my other creamy/moist lipsticks and faded minimally and evenly. 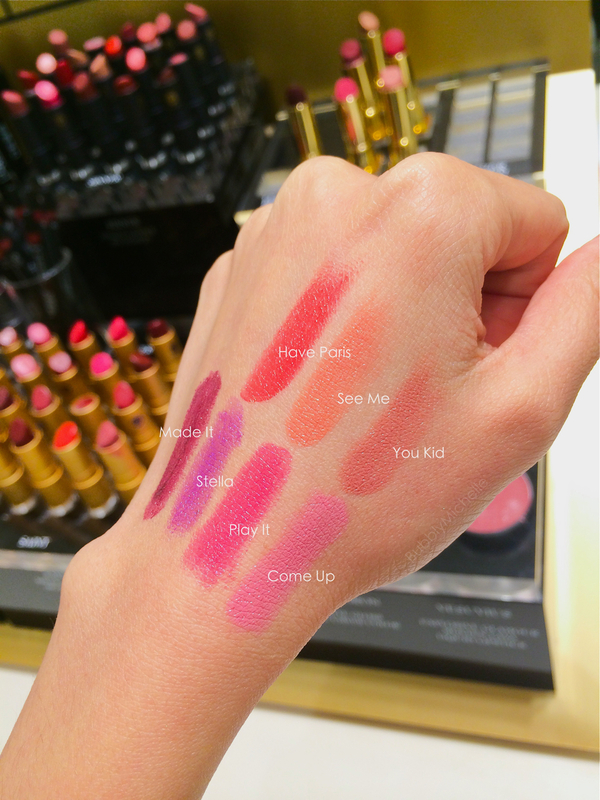 Here are swatches of the entire range. From the 7 I found that there were slight variations in pigmentation. Come Up being the most pigmented as it felt thicker, with Made It & Stella on the lower end of the spectrum swatching almost balmy. Bottom line, I believe this is a fabulous lipstick to own, the quality was there without a doubt. And I would most certainly buy more and I feel they were worth the price. If your budget allows you, try one, you won’t be disappointed. And I highly recommend Come Up, Play It, You Kid and Have Paris to start with. Waw ! Play it is Gorgeous on you ! I almost fell out of my chair when I saw my little ‘ol blog on your “Blogs I Follow” list. You have made my month (and it’s only the 2nd!!!). Thank you my beautiful friend! Hello beautiful! I am finally getting round to catching up on your blog-it’s been a while! So excited to see this review, as you know, the minute you posted the instagram swatches I was on Space NK buying Play It (which I intended to get all along) and Have Paris. Am truly in love with your blog photography. Would love to know what you use to generate such a gorgeous clean, light, bright white background! I’m still weighing up if it is worth the price tag. Play it looks gorgeous as does have Paris. Urgh I am so torn.